Scarecrows are synonymous with Autumn. This little guy is so adorable you just can’t resist him! Paint several to give away as gifts, or make one just for yourself to keep in the kitchen. Base coat surface with 2-3 coats of Antique White. Trace pattern onto base coated surface. Paint pumpkin with Pumpkin paint. Shade lines with Tangerine and Georgia Clay. Paint face, hands and feet with AC Flesh. Paint nose with Georgia Clay and shade with Black. Draw on mouth eyes and stitches with Micron craft pen. Use ratty or scruffy brush to dot on cheeks with Pink Quartz. Paint hat with Bonnie Blue. Mix a very small amount of black with Bonnie Blue to use for shading hat. Patches are Trail Tan, criss-cross with Georgia Clay. Paint pumpkin stem and vines with Dark Forest Green. Use fine liner brush with Yellow and Georgia Clay for straw around feet, hands and face. 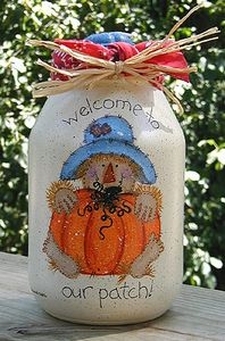 Use Micron craft pen to draw on all stitches around hat and pumpkin. Splatter completed surface with White and then with Black using the bristles of an old toothbrush. Sign your work! Spray your completed project with 2-3 coats of acrylic spray sealer according to directions on can. Tip: If you are painting on jars, prepare your surface by washing the jar, completely removing all labels and glue, then giving the jar a rinse in white vinegar or rubbing alcohol. Allow the first coat of base to dry completely before attempting second coat! Author Amanda Formaro is the entrepreneurial mother of four children. She is also the owner of FamilyCorner.com Magazine.